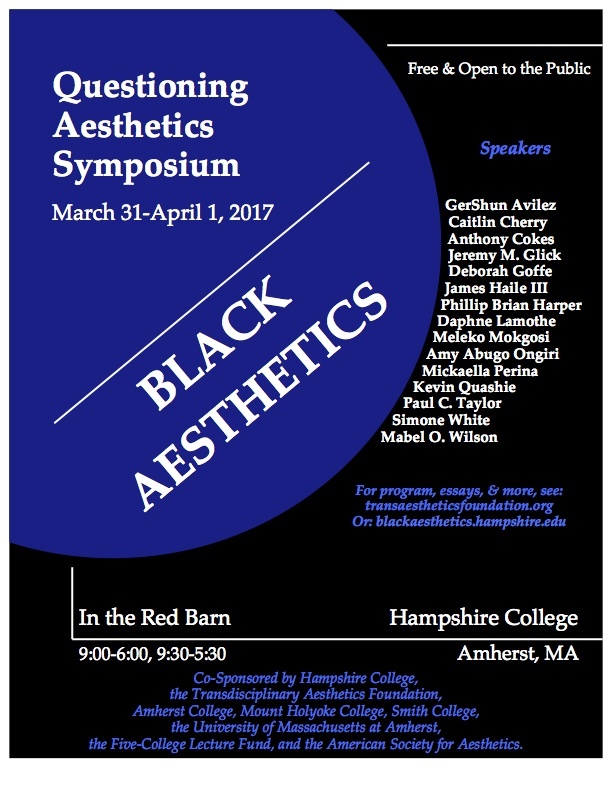 Inspired by the recent publication of numerous books on Black Aesthetics from a wide range of disciplines, many of which are provoked by the tragic deaths, incarceration, conditions of inequality, and forms of creative resistance affecting black people today, Monique Roelofs and Michael Kelly are organizing a two-day “Questioning Aesthetics Symposium on Black Aesthetics” at Hampshire College. With the title “Black Aesthetics” we do not assume any one conception of Black Aesthetics or even that there is such a thing, as we understand aesthetics to be critical thinking about art, culture, design, and nature, often in relation to social, political, and moral issues. Five panels with 15 speakers followed by a roundtable for all attendees are designed to explore new questions, models and directions in this vibrant field of inquiry. The Symposium took place March 31—April 1, 2017, at Hampshire College in Amherst, MA.